This is the second in a series of posts about how different demographic groups in the U.S. have fared in the digital age. More than 56 million people in the United States are living with a disability, according to the U.S. Census Bureau. But even as a growing share of these Americans report going online or owning a smartphone, the digital divide between those who have a disability and those who don’t remains large. Disabled Americans are about three times as likely as those without a disability to say they never go online (23% vs. 8%), according to a Pew Research Center survey conducted in the fall of 2016. When compared with those who do not have a disability, disabled adults are roughly 20 percentage points less likely to say they subscribe to home broadband and own a traditional computer, a smartphone or a tablet. Adults who report having a disability are also less likely to have multiple devices that enable them to go online. 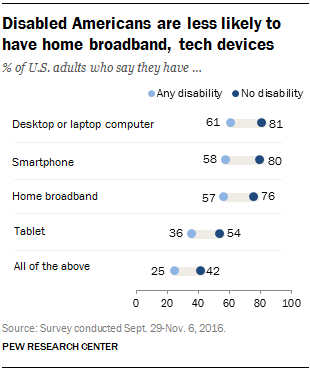 One-in-four disabled adults say they have high-speed internet at home, a smartphone, a desktop or laptop computer and a tablet, compared with 42% of those who report not having a disability. The amount of time people spend online and their comfort level with technology also varies by disability status. Disabled Americans are less likely than those who don’t have a disability to report using the internet on a daily basis (50% vs. 79%). They are also less likely to say that having a high level of confidence in their ability to use the internet and other communication devices to keep up with information describes them “very well” (39% vs. 65%), according to a Pew Research Center survey conducted in spring 2016. These findings are based on a pair of surveys conducted by the Center last year, when roughly one-in-six U.S. adults (16%) reported that they lived with a disability (defined here as a “health problem, disability or handicap currently keeping you from participating fully in work, school, housework or other activities”). The latest figures from the Census Bureau estimate that 19% of the U.S. population has some form of disability – a similar share to what the Center found. It is important to note that there are various forms of disabilities, often ranging in severity, so this question is meant to be a broad look at disabled Americans. Due to the nature of the surveys associated with this data, certain Americans with disabilities are likely undercounted. The figures reported on adoption and internet use are from phone surveys that were conducted via landlines and cellphones and likely under-covered adults who are deaf or have difficulty speaking. The data on the sharing economy are from a survey by Pew Research Center’s American Trends Panel. Initial recruitment surveys for the panel were conducted on landlines and cellphones, so adults who are deaf or have difficulty speaking were likely under-covered. The estimates reported here are from panel surveys conducted via the web and mail, which may underrepresent blind people. In addition, our surveys do not cover those living in institutionalized group quarters, which may include some severely disabled individuals. The disabled population is disproportionally comprised of seniors, and this is an age group that generally has lower levels of digital adoption than the nation as a whole. Indeed, disabled Americans younger than 65 have much higher rates of having home broadband services and owning digital devices than those ages 65 and up. 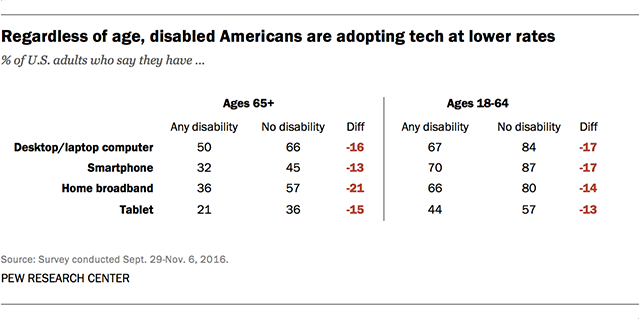 Still, even among younger adults, people with a disability are less likely to report using digital technology. For example, 67% of disabled Americans ages 18 to 64 say they own a desktop or laptop computer, compared with 84% of those in the same group who don’t have a disability. There are tools on the market aimed at making the digital experience more accessible to disabled Americans. Social media companies, for example, have experimented with artificial intelligence to help the visually impaired use their platforms, while other tech companies are expanding their screen-reading software and mobile apps. But there have also been dozens of lawsuits in recent years, claiming some websites are not accessible to those with disabilities. The Department of Justice is currently seeking public comments on how to ensure that the internet adheres to the federal Americans with Disabilities Act. Some experts have suggested the sharing economy may bring about a more inclusive digital experience. Data from a 2015 Pew Research Center survey show that disabled Americans have the same or less experience with the sharing economy when compared with those who report having no disabilities. For example, only 7% of adults with a disability say they have ever used a ride-hailing app, compared with 18% of adults who don’t have a disability. But disabled Americans are also just as likely as those without a disability to say they have ever ordered groceries online or hired someone to do a task or run an errand via an online platform (only around 5% of both groups say they have done either of these online activities).